If you're looking for a summer shoe to make a statement without ruining the girlish look of your flirty summer skirts and dresses, the "Covent" sandal is a great option. 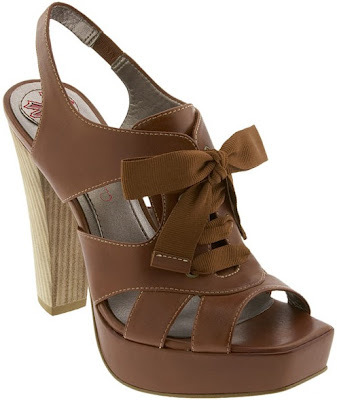 This cute, lace-up sandal has a slight oxford-inspired feel with a large grosgrain laces, which create a feminine bow. The one-inch platform under the toe make the heel (just over four inches high) a little more wearable. The "Covent" only comes in brown and is only offered in whole sizes. However, it is leather so it should shape the the foot nicely after a little wear. It costs $79.95 at Nordstrom.